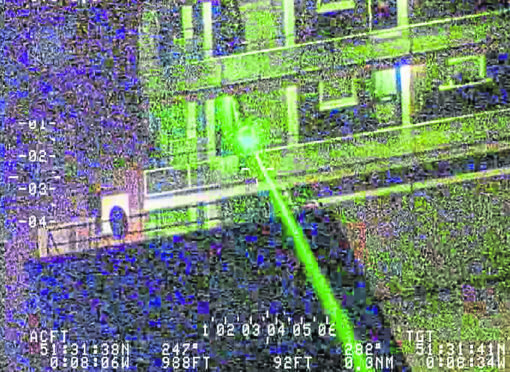 Footage issued by the National Police Air Service (NPAS) of an incident in which a laser was directed at a police helicopter, as people shining laser pens at pilots, train and bus drivers could be jailed or face hefty fines under a tougher new law. Owners of laser devices face tougher penalties for misusing what they “mistakenly believed to be a toy”, pilots have warned. From July 10, anyone caught targeting aircraft, road vehicles or boats with a laser beam faces up to five years in prison, an unlimited fine, or both. The Laser Misuse (Vehicles) Act will also make it an offence to point a laser at air traffic controllers. It is hoped prosecutions will become easier and quicker by removing the need for police officers to establish proof of intention to cause a safety hazard. The legislation makes it a punishable offence if the act of shining a laser beam is done deliberately or without reasonable precautions to avoid doing so. There have been several recent cases across the north and north-east where lasers have been used to cause harm. In October, a 13-year-old girl was left with impaired vision after a classmate shone a laser pen into her eye on the bus to Fortrose Academy. In the wake of the incident Kate Forbes, MSP for Skye, Lochaber and Badenoch, questioned Scottish ministers on the easy access to laser pens. The Cromarty Firth Port Authority revealed that five vessels had been affected by lasers being directed at them as they carried out work off the Black Isle in 2016. One worker even had to seek medical help after the beam was shone directly into his eye. Later that year pilots of a coastguard helicopter were targeted as they returned from a rescue mission in Skye, with a beam temporarily blinding the pilot and endangering the lives of those on board the aircraft. Former RAF and British Airways pilot Steve Landells, who is a flight safety specialist at pilots’ union Balpa, said: “Laser users need to get to grips with this law change or they could soon find themselves facing time in jail. “Lasers are not toys. If you have one and don’t have a legitimate reason for owning it, or if you have bought one for your kids, we suggest you take the batteries out and throw it away. Laser misuse has become a growing concern, particularly near airports where they can dazzle and distract pilots and air traffic controllers. UK airports reported 989 laser incidents to the Civil Aviation Authority last year. Heathrow was the worst affected with 107 incidents, followed by Gatwick (70), Manchester (63) and Birmingham (59). In a statement released when the new laws received Royal Assent last month, Aviation Minister Baroness Sugg said: “We are taking action to provide greater protection against irresponsible laser use. “Lasers can have very serious, potentially fatal consequences and offenders should face tough penalties for endangering the lives of others.